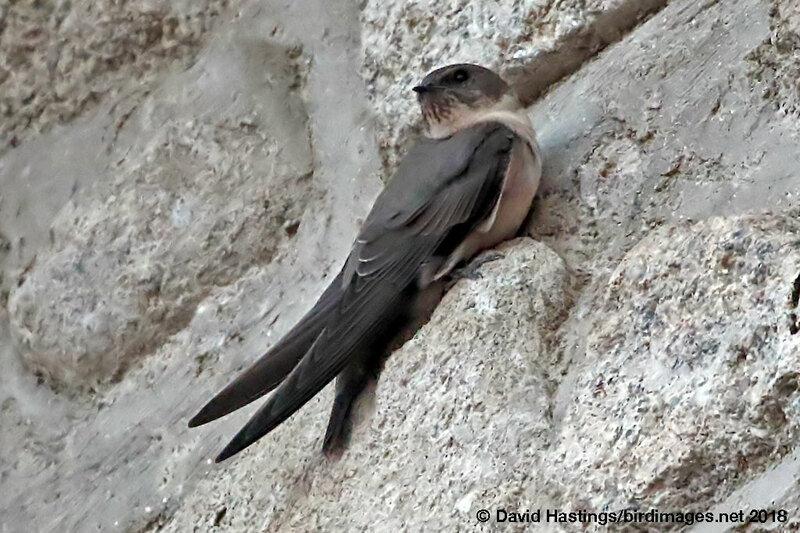 Crag Martin (Ptyonoprogne rupestris). Taken at Trujillo, Spain on November 16th 2018. Taken at Trujillo, Spain on November 16th 2018. A rather large and compact swallow, with a heavy body, broad neck and broad pointed wings. It is a drab grey-brown above and brown-tinged greyish-white below. It is mainly found around the Mediterranean basin. It is a summer migrant in the north of its region. It breeds in caves and cavities on cliff faces, sometimes in holes in walls and buildings. The Crag Martin's flight is relatively slow for a swallow. Rapid wing beats are interspersed with flat-winged glides, and its long flexible primaries give it the agility to maneuver near cliff faces. It is regarded as being of Least Concern by the IUCN.